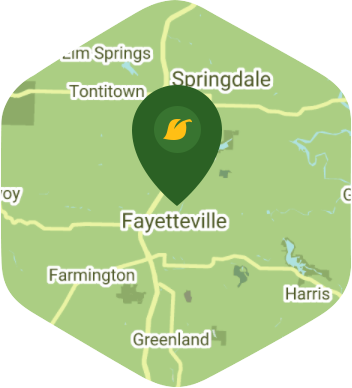 You, as a lifelong resident and homeowner in Fayetteville, are already aware of the many attractions that your city has to offer. From the wonderful views at Wilson Park to some exciting Arizona Razorbacks games at Bud Walton Arena, Fayetteville is a city that is synonymous with the word "excitement". Yes, living here can be quite exciting, but you know what isn't? Having to mow your lawn on your days off. Why would you want to waste a perfectly good weekend doing lawn mowing when you can be hanging out with friends instead? Let Lawn Love's lawn mowing service handle this problem for you so you can go out and have yourself a bit of fun. All you have to do is schedule everything online through our mobile app or website, and once you're done setting up your lawn mowing service, our independent lawn pros will come to your home on schedule. They'll bring the equipment, experience and expertise while you just sit back and watch them mow your lawn like the true pros they are. Our guys will cut your grass at the right height and we will work hard to give you the lawn that you've always envisioned of having. Give us a call now at 501-406-2264 or ask for a free quick online quote. Rated 4.71 / 5 stars in 100,167 Lawn Love customer reviews.